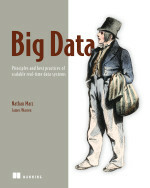 Get this book, whether you are new to working with Big Data or now an old hand at dealing with Big Data’s seemingly never-ending (and steadily expanding) complexities. You may not agree with all that the authors offer or contend in this well-written “theory” text. But Nathan Marz’s Lambda Architecture is well worth serious consideration, especially if you are now trying to come up with more reliable and more efficient approaches to processing and mining Big Data. The writers’ explanations of some of the power, problems, and possibilities of Big Data are among the clearest and best I have read. “More than 30,000 gigabytes of data are generated every second, and the rate of data creation is only accelerating,” Marz and Warren point out. Thus, previous “solutions” for working with Big Data are now getting overwhelmed, not only by the sheer volume of information pouring in but by greater system complexities and failures of overworked hardware that now plague many outmoded systems. The Lambda Architecture has three layers: the batch layer, the serving layer, and the speed layer. In Part 1, chapters 4 through 9 deal with various aspects of the batch layer, such as building a batch layer from end to end and implementing an example batch layer. This book requires no previous experience with large-scale data analysis, nor with NoSQL tools. However, it helps to be somewhat familiar with traditional databases. Nathan Marz is the creator of Apache Storm and originator of the Lambda Architecture. James Warren is an analytics architect with a background in machine learning and scientific computing. If you think the Big Data world already is too much with us, just stick around a while. Soon, it may involve almost every aspect of our lives.